dorette snover here, i am wondering if the libyans have historically used the poivre long peppercorn in their dishes? also, here is a link to a pepper purveyor that we visited in provence in focalquier. gerard vive. I am not familiar if Libyans used long pepper historically. My guess is that they did not. The dish can also be made with fish. Bazīn is often made for the Id al-Kabir, the holiday feast celebrating the sacrifice of Abraham, in the Sfax and Sousse region of Tunisia. Like much of the cooking in Egypt, everything appears vaguely familiar, from other regions. 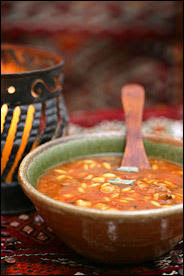 I am a Libyan, if you need mor recipies to try I will send it to you. Regarding bzar this is not for ((tripolitanian)) recipies because we don't add cumin, we belive cumin is for fish recipies. I tasted this recipe one day that we were camping in the mountain I remember that bears ate our food so we had to visit a restaurant and they had this recipe in the menu of course I ordered it because the day was so cold and it was great. Recipe seems to be delicious. I'm trying cook this today. Pretty good post, this is one of the best articles that I have ever seen! This is a great site and I have to congratulate you on the content. I Appreciate it.